An abdominal aortic aneurysm, also called AAA or triple A, is a bulging, weakened area in the wall of the aorta (the largest artery in the body) resulting in an abnormal widening or ballooning greater than 50 percent of the vessel’s normal diameter (width). Ambulatory phlebectomy involves the removal of the vein by tiny punctures or incisions along the path of the enlarged vein. Through these tiny holes, the surgeon uses a surgical hook to remove the varicose vein. In cardiac catheterization (often abbreviated as “cath”), a very small catheter (hollow tube) is advanced from a vessel in the groin (or sometimes the arm) up into the heart. Cardiac resynchronization therapy (CRT) uses pulses of electricity to help the ventricles, or the two lower chambers of the heart, beat as they should. CRT is used to help moderate to severe heart failure. It is also used to help coordinate the beating of the ventricles when they aren’t coordinated. A carotid artery duplex scan is a type of vascular ultrasound study done to assess the blood flow of the arteries that supply blood from the heart through the neck to the brain. There are six carotid arteries–the right and left common carotid arteries, which divide and form the right and left internal carotid arteries and the right and left external carotid arteries. One pair (external and internal) is located on each side of the neck. Carotid endarterectomy (CEA) and carotid artery angioplasty with stenting (CAS) are procedures performed to treat carotid artery disease in certain circumstances. Carotid artery disease, also called carotid artery stenosis, occurs when the carotid arteries, the main blood vessels that carry oxygenated blood to the brain, become narrowed. Chronic venous insufficiency occurs when the leg veins do not allow blood to travel back to the heart. (Arteries carry blood away from the heart, while veins carry blood to the heart). Problems with valves in the veins can cause the blood to flow both directions, not just toward the heart. These valves that are not working properly can cause blood in the legs to pool. If chronic venous insufficiency is left untreated, pain, swelling, and leg ulcers may result. Chronic venous insufficiency does not pose a serious health threat, but the condition can be disabling and cause pain. Computed tomography (CT or CAT scan) is a noninvasive diagnostic imaging procedure that uses a combination of X-rays and computer technology to produce horizontal, or axial, images (often called slices) of the body. A CT scan shows detailed images of any part of the body, including the bones, muscles, fat, and organs. CT scans are more detailed than standard X-rays. Coronary artery bypass graft surgery (CABG) is a procedure used to treat coronary artery disease in certain circumstances. Coronary artery disease (CAD) is the narrowing of the coronary arteries (the blood vessels that supply oxygen and nutrients to the heart muscle), caused by a buildup of fatty material within the walls of the arteries. This buildup causes the inside of the arteries to become rough and narrowed, limiting the supply of oxygen-rich blood to the heart muscle. A dobutamine stress echocardiogram is a diagnostic procedure that may be used when a physician wants to assess the heart muscle under stress. If exercise on a treadmill is not an option (too much stress on the heart) due to a person’s medical condition, a physician may use an intravenous medication called dobutamine. Dobutamine causes the heart to beat faster and will mimic the effects of exercise on the heart. An electrocardiogram (ECG or EKG) is one of the simplest and fastest procedures used to evaluate the heart. Electrodes (small, plastic patches) are placed at certain locations on the chest, arms, and legs. When the electrodes are connected to an ECG machine by lead wires, the electrical activity of the heart is measured, interpreted, and printed out for the physician’s information and further interpretation. An electrophysiological study (EP study) is an invasive procedure that tests the heart’s electrical system. 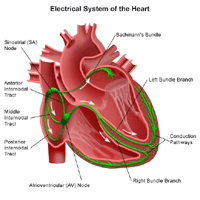 The electrical system of the heart generates the heart beat. An echocardiogram is a noninvasive (the skin is not pierced) procedure used to assess the heart’s function and structures. An exercise echocardiogram is performed to assess the heart’s response to stress or exercise. During the procedure, a transducer (like a microphone) sends out ultrasonic sound waves at a frequency too high to be heard. When the transducer is placed on the chest at certain locations and angles, the ultrasonic sound waves move through the skin and other body tissues to the heart tissues, where the waves bounce or “echo” off of the heart structures. The transducer picks up the reflected waves and sends them to a computer. The computer displays the echoes as images of the heart walls and valves. Femoral popliteal (also called femoropopliteal) bypass surgery is a surgical procedure that may be used to treat severe blockage due to plaque in the femoral artery. A newer, minimally-invasive procedure is percutaneous transluminal angioplasty (PTA) of the femoral arteries. Heart valve repair or replacement surgery is a treatment option for valvular heart disease. When heart valves become damaged or diseased, they may not function properly. Conditions which may cause heart valve dysfunction are valvular stenosis and valvular insufficiency (regurgitation). The Holter monitor is a type of electrocardiogram (ECG or EKG) used to monitor the ECG tracing continuously for a period of 24 hours or longer. A standard or “resting” ECG is one of the simplest and fastest procedures used to evaluate the heart. Electrodes (small, plastic patches) are placed at certain locations on the chest and abdomen. When the electrodes are connected to an ECG machine by lead wires, the electrical activity of the heart is measured, interpreted, and printed out for the doctor’s information and further interpretation. Magnetic resonance imaging (MRI) is a diagnostic procedure that uses a combination of a large magnet, radiofrequencies, and a computer to produce detailed images of organs and structures within the body. A myocardial perfusion scan is a type of nuclear medicine procedure. This means that a tiny amount of a radioactive substance, called a radionuclide (radiopharmaceutical or radioactive tracer), is used during the procedure to assist in the examination of the tissue under study. Specifically, the myocardial perfusion scan evaluates the heart’s function and blood flow. A permanent pacemaker, a small device that is implanted under the skin (most often in the shoulder area just under the collarbone), sends electrical signals to start or regulate a slow heartbeat. 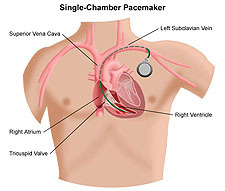 A permanent pacemaker may be used to make the heart beat if the heart’s natural pacemaker (the SA node) is not functioning properly and has developed an abnormally slow heart rate or rhythm, or if the electrical pathways are blocked. Percutaneous transluminal coronary angioplasty (PTCA) is performed to open blocked coronary arteries caused by coronary artery disease (CAD) and to restore arterial blood flow to the heart tissue without open-heart surgery. A special catheter (long hollow tube) is inserted into the coronary artery to be treated. This catheter has a tiny balloon at its tip. The balloon is inflated once the catheter has been placed into the narrowed area of the coronary artery. The inflation of the balloon compresses the fatty tissue in the artery and makes a larger opening inside the artery for improved blood flow. Resting radionuclide angiogram (RNA) is a type of nuclear medicine procedure. This means that a tiny amount of a radioactive substance, called a radionuclide (radiopharmaceutical or radioactive tracer), is used during the procedure to assist in the examination of the tissue under study. Specifically, resting RNA evaluates the heart’s chambers in motion. Resting and exercise radionuclide angiogram (RNA) is a type of nuclear medicine procedure. This means that a tiny amount of a radioactive substance, called a radionuclide (radiopharmaceutical or radioactive tracer), is used during the procedure to assist in the examination of the tissue under study. Specifically, resting RNA evaluates the heart’s chambers in motion. A right heart catheterization is performed to determine how well the heart is pumping and to measure the pressures in the heart and lungs. Right heart catheterization (often abbreviated as right heart cath) with heart tissue biopsy is a procedure in which tissue samples are taken directly from the heart muscle. This procedure may be done in addition to a right heart cath to see if the heart tissue is normal. Sclerotherapy is very successful and the most popular method for eliminating spider veins. In this procedure, a tiny needle is used to inject a medication directly into the vein. This medication causes an irritation to the inner lining of the vein and results in closure of the vein. With time, the vein disappears. An electrocardiogram (ECG or EKG) is one of the simplest and fastest procedures used to evaluate the heart. Electrodes (small, plastic patches) are placed at certain locations on the chest, arms, and legs. When the electrodes are connected to an ECG machine by lead wires, the electrical activity of the heart is measured, interpreted, and printed out for the doctor’s information and further interpretation. A tilt table procedure is a diagnostic procedure that may be used to evaluate a person who has symptoms of syncope (fainting). When a person has a complaint of syncope, the physician will carefully evaluate the person’s past medical history and perform a physical examination. If basic components of the examination or history do not reveal a potential cause for the syncope, and the person has no history of heart disease, then further diagnostic procedures may be scheduled. A transcatheter aortic valve replacement (TAVR) is a new and innovative approach to the treatment of severe aortic stenosis (narrowing of the aortic valve opening). Instead of standard open heart surgery, a balloon catheter is placed in the femoral artery (in the groin) and guided into the heart. A compressed heart valve is then placed in the catheter and positioned directed inside the diseased aortic valve. Once in position, the balloon is inflated to secure the valve in place. A transesophageal echocardiogram (TEE) is a diagnostic procedure that uses echocardiography to assess the heart’s function. Echocardiography is a procedure used to assess the heart’s function and structures. During the procedure, a transducer (like a microphone) sends out ultrasonic sound waves at a frequency too high to be heard. When the transducer is placed on the chest at certain locations and angles, the ultrasonic sound waves move through the skin and other body tissues to the heart tissues, where the waves bounce or “echo” off of the heart structures. The transducer picks up the reflected waves and sends them to a computer. 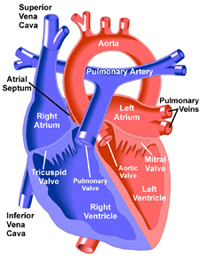 The computer displays the echoes as images of the heart walls and valves. 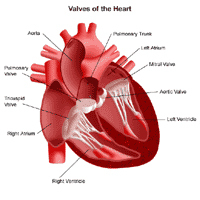 Valvuloplasty is performed, in certain circumstances, to open a stenotic (stiff) heart valve. In valvuloplasty, a very small, narrow, hollow tube, or catheter, is advanced from a blood vessel in the groin through the aorta into the heart. Once the catheter is placed in the valve to be opened, a large balloon at the tip of the catheter is inflated until the leaflets (flaps) of the valve are opened. Once the valve has been opened, the balloon is deflated and the catheter is removed. Varicose veins are enlarged veins that are visible through the skin and may appear as blue or purple twisted, knot-like cords. Varicose veins can occur anywhere in the body, but are more commonly found on the legs. A venogram is a procedure that provides X-ray visualization of the veins, particularly in the lower extremities (legs). A special dye is injected that is visible on X-ray. The contrast dye allows the doctor to evaluate the size and condition of the veins. A venogram is one of the more accurate tests used for diagnosing deep vein thrombosis (DVT), but can also be used to diagnose other abnormalities.